Teaching at Cleveland School of the Arts, 2009. While also studying at the Cleveland Institute of Music, Jones offered her services as a substitute bass teacher for the Preparatory Department of CIM, first assisting with the school's Preparatory Orchestras during rehearsals and coaching sectionals, then teaching a full studio of young bassists in a private lesson setting as well as group classes for the Spring semester. The CIM Bass Quartet, of which Jones was a member in 2009, also appeared numerous times at various public schools in Cleveland, performing and afterward speaking with students about the instrument, college and being a professional musician. Kate completed her training with Suzuki Teacher Trainer Virginia Dixon and was registered as a Suzuki Teacher for Bass Books 1, 2 and 3 in the Summer of 2009. That summer she also served as a faculty member at the Summer Festival American Suzuki Institute at the University of Wisconsin-Stevens Point. In 2010 Kate returned to Stevens Point for teacher training and completed Bass Book 4. Kate anticipates returning for Bass Book 5 in Stevens point this summer. While a faculty member of the Cleveland Music Settlement, she also taught private lessons at area schools such as Cleveland School of the Arts, Luther Memorial School and as a substitute at the Preparatory school at the Cleveland Institute of Music. Kate later moved to Denton, Texas to pursue further graduate studies. She was an adjunct faculty member at Tarleton State University, Austin College and Henderson State, and held a teaching fellow position at University of North Texas until she graduated in 2014. She currently is the resident bass specialist at Hurst-Euless-Bedford Independent School District. Teaching at the Bradetich Annual Masterclass, Summer 2012. University of North Texas. 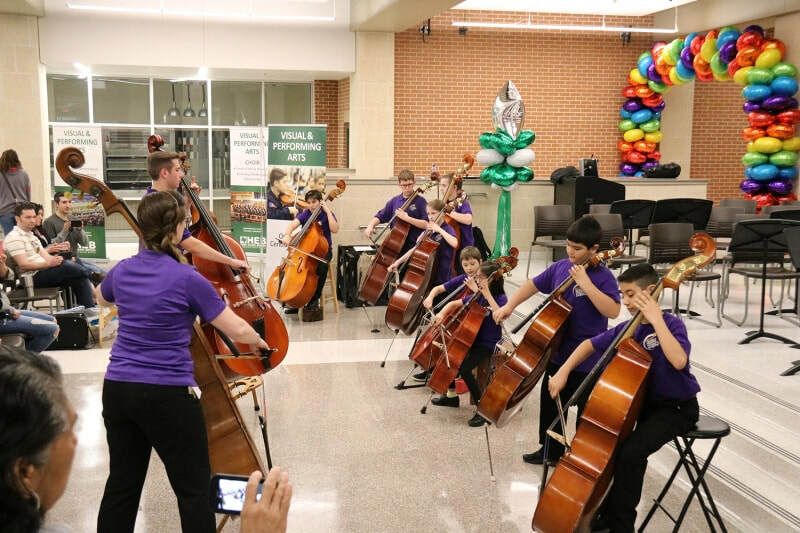 Leading the basses of HEB ISD at the 2018 District Showcase.